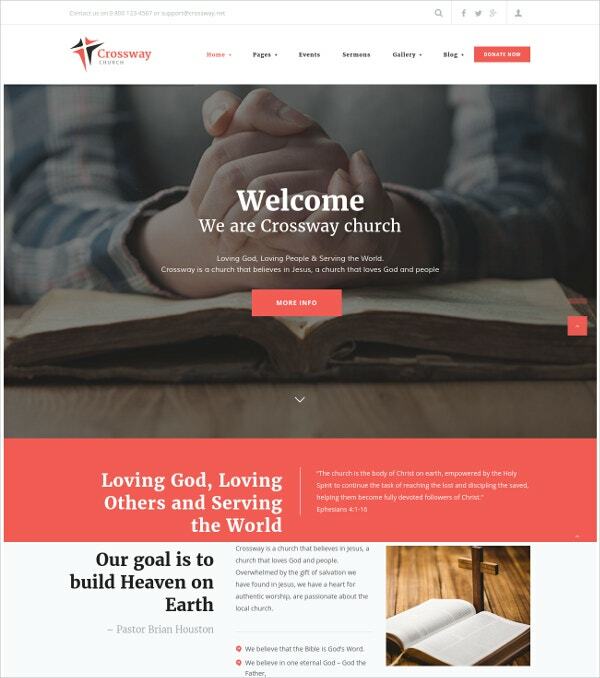 Church Website Templates must be chosen as carefully as corporate website templates, so that your website can communicate the joy and inspiration to your audience. 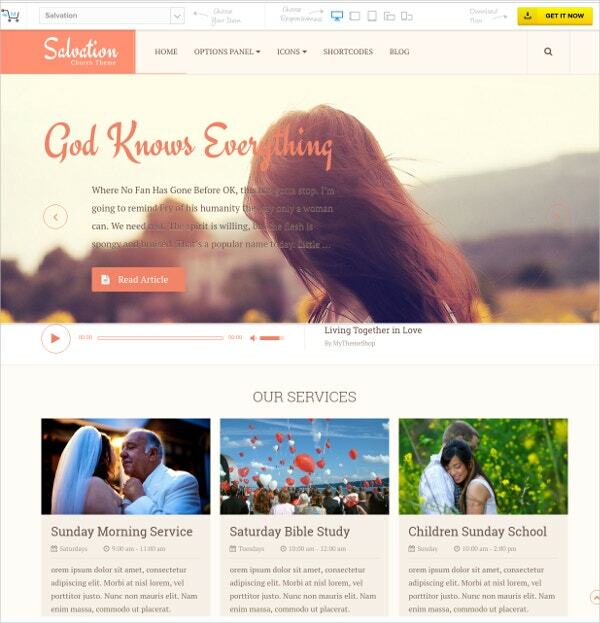 Inspire reverence and devotion with Spiritual Website Templates based on WordPress, HTML and other platforms. These templates can be used for prayers, sermons, holy ceremonies, festivals and other church events. Use modern techniques and animation effects, slideshows, rich media and more to engage your audience on the subject of religion. The following church templates can help you attract their attention and touch their hearts. This template from Joomla is designed to share religious news with your audience. It is a beautiful, clean and elegant website where you can arrange latest news, headlines, featured blog posts and more in an uncluttered layout. You can add elements like animated filtered portfolio, start with custom page types, Komento comments and more. 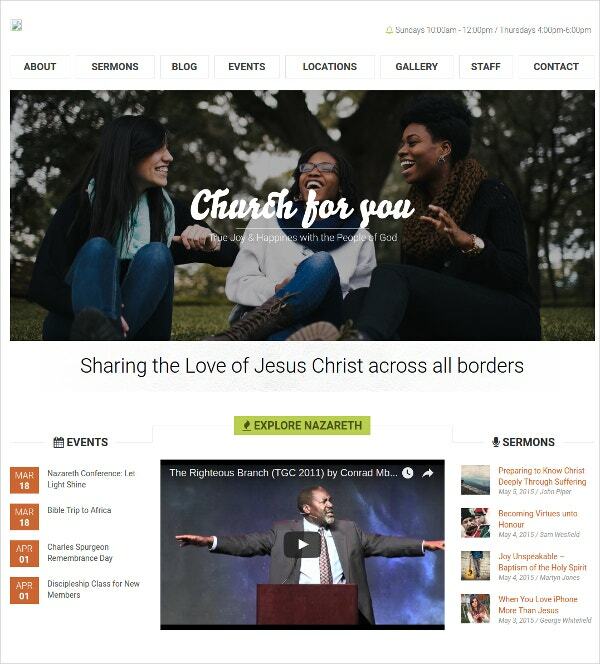 The responsive Church Website Template looks great on all devices. You can upload an image on the slider at the top of the homepage, redesign premade pages for ministry, sermons, home, about, image gallery and more to suit your needs. The template also lets you add event and programs, an event calendar with Google calendar and more. 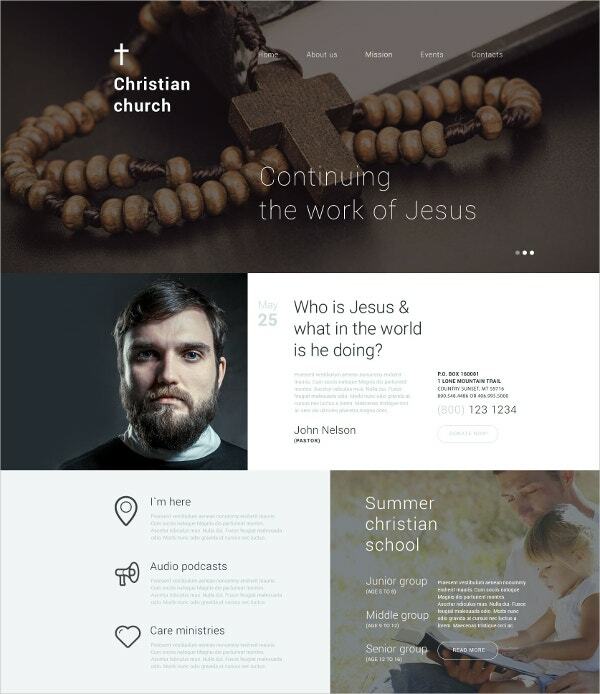 Christian Responsive template for WordPress is a beautiful theme with calm yet bright blue colors and a unique design. The theme is fully responsive and comes with over 80 shortcodes for adding elements without writing long lines of code. It is easy to customize and includes an admin panel, WPML ready features, video support and audio player and other features. Bethlehem is a simple and modern template that can be used by churches, prayer groups, non-profits, mosques, charity and other purposes. It comes with a Slider Revolution, Visual Composer for drag and drop website building, 15 fully customizable PSD files and a powerful theme options panel where you can change elements on the page with a few clicks. 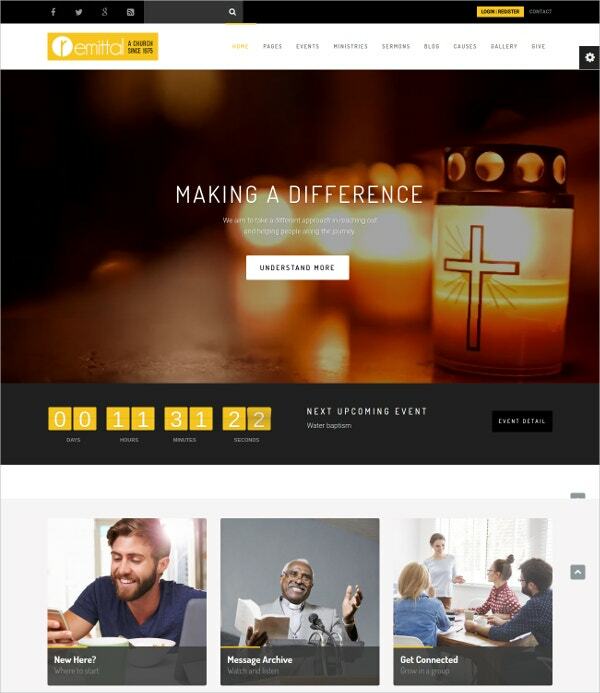 If you prefer Drupal as a platform, Christian Shelter Drupal template gives you a set of demos to get started. It features plenty of modules that you can redesign your website with. Additional features include Google map, readable typography, video and retina ready icons, social login, follow buttons, contact form, sortable gallery, dropdown menu and more. The Church Suite is a powerful theme for the modern church that is fully customizable, lightweight and fully equipped to manage events. The theme comes with an exclusive events manager, a causes and donations manager and an advanced sermons manager. It lets you arrange events in a neat grid, add events to a calendar, share upcoming events, cover events and more with premade templates. 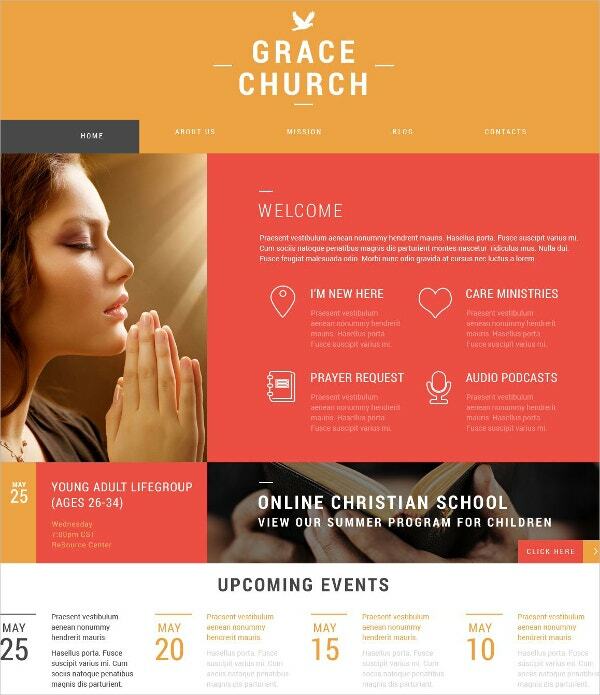 The Free Church Template is simple and unassuming, with a full width and fluid layout, plenty of widget areas to customize, a large footer and theme options that you can use to personalize the sample for your church website, non-profit etc. You can customize everything including a sticky header, colors, footer, menu, widgets, CSS live and more. It is also WooCommerce ready. 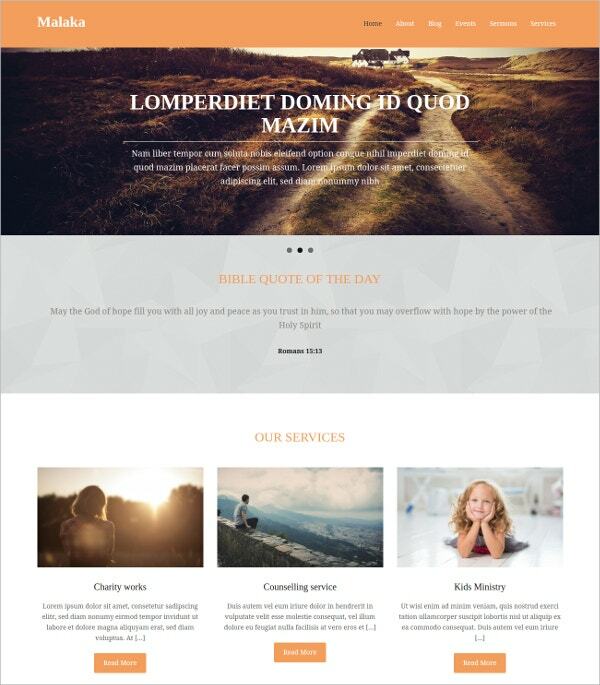 The Christian Church template for WordPress is a popular theme with a high quality and unique design. The theme is mobile ready and fully customizable. It is easy to manage fonts, backgrounds, colors, layouts and other elements of the website with the admin panel. You can add sliders and slider images for a visually appealing effect, add video and audio, carousel and isotope galleries and other elements. 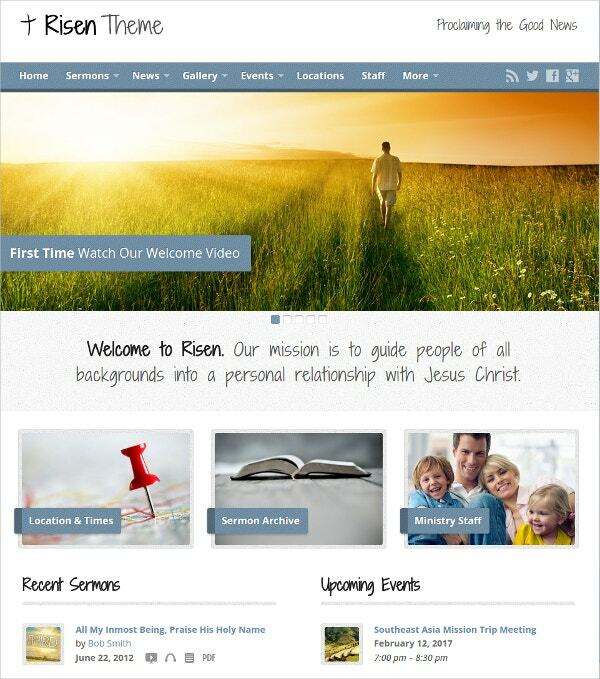 Risen is a responsive and retina ready theme that looks great on every device. It includes responsive shortcodes, custom menu, custom widgets, social media icons, breadcrumb path, automatic resizing of images, translation ready files and more. The theme is designed with HTML5 and CSS3, and it is easy to customize with over 200 Google fonts, custom colors, backgrounds, theme options and more. Nazareth is a church theme that is built on the Underscores framework and is easy to use. It is retina ready and responsive. Features include MailChimp integration, with which you can send out newsletters, Twitter bootstrap which makes it mobile friendly, a sermon and staff manager and unlimited colors and sidebars. 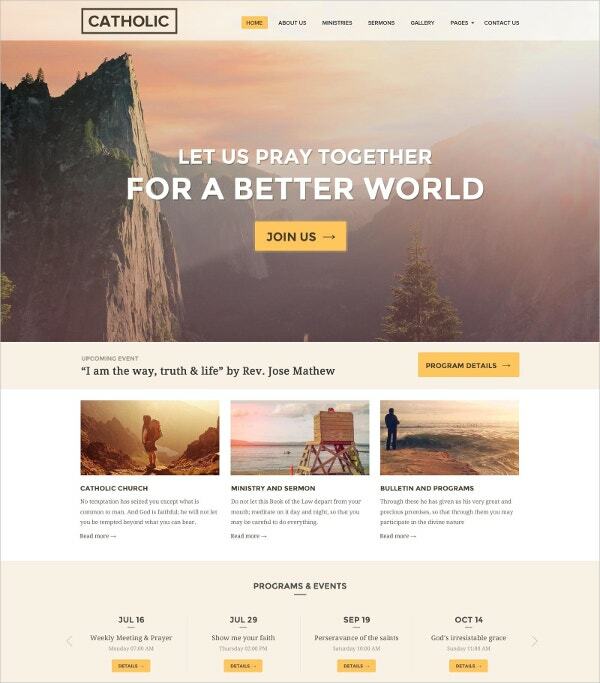 Salvation is a responsive WordPress theme with a fresh and clean layout that is well-suited for church websites. You can easily customize the layout with a drag and drop homepage builder and event management system. It is also fully responsive and includes a donation form and custom widgets to help you engage with your audience. 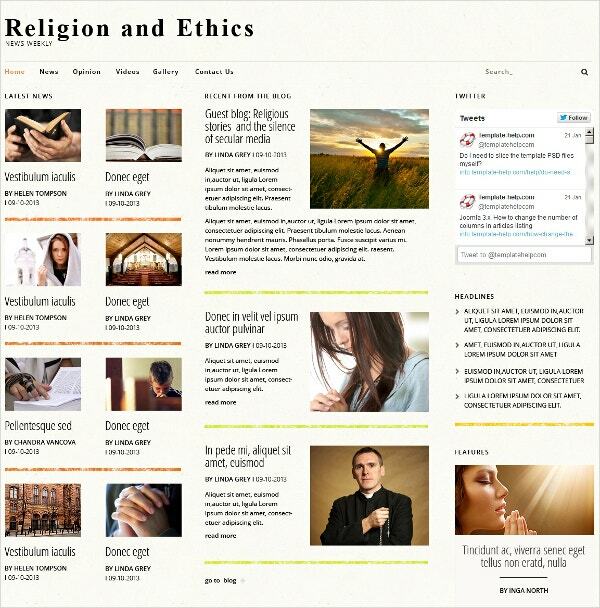 Religious Organization is a bright and refreshing template that is fully responsive and fully editable. 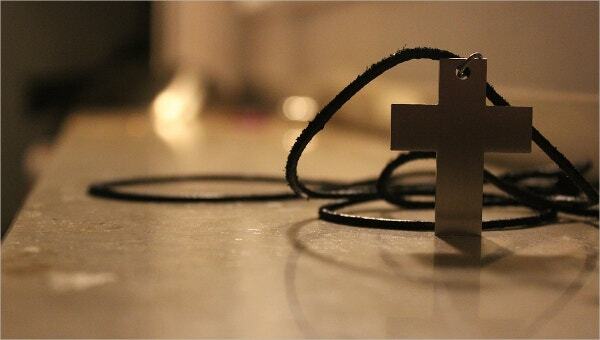 It has a professional look so it can be used to communicate ideas for any religious organization. The homepage uses a clear color division to separate the different areas and make it pleasing to the eye. Features include lazy load effect, various types of galleries, custom post types such as Portfolio, Testimonials, Services etc., advanced theme options etc. 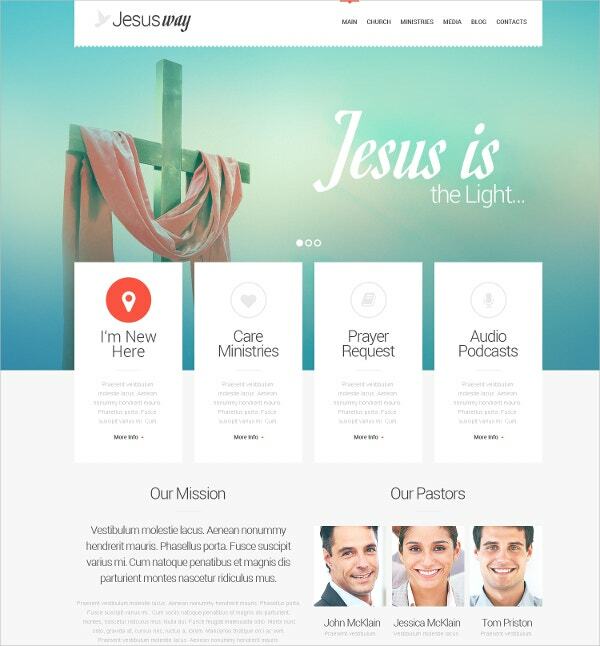 Dunamis is a modern church theme that you can use for your church or religious movement. The template lets you set up your website in minutes, with a blog, donations, events area, podcasting and more. It comes with a Mega Menu, drag and drop interface and custom frontpage composer with which you can easily custom-design your website. CrossWay is a simple and classic but modern template that includes features such as an events calendar, a donations plugin and WooCommerce integration. The template is easy to install with one-click installation. It is built with HTML5 and CSS3. You can choose a boxed or full-width layout, different header styles, hover effects, Visual Composer with which to drag and drop elements on the page and more. 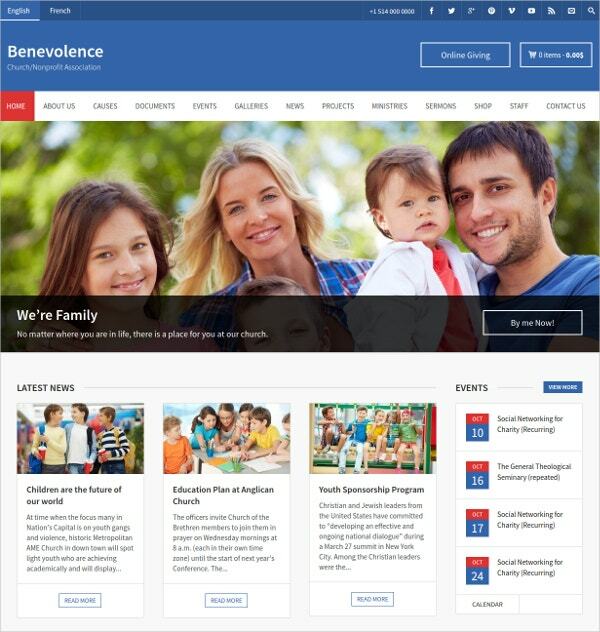 With Benevolence, you can create a simple, clean and light theme with plenty of bright color accents for a friendly layout. The template is already very popular with churches and nonprofits around the world. Highlights include speed optimization – the theme has received a speed grade of A94%. You can further list recurring events, set up Google calendar, set up Paypal for collecting donations, set up a WooCommerce system etc. 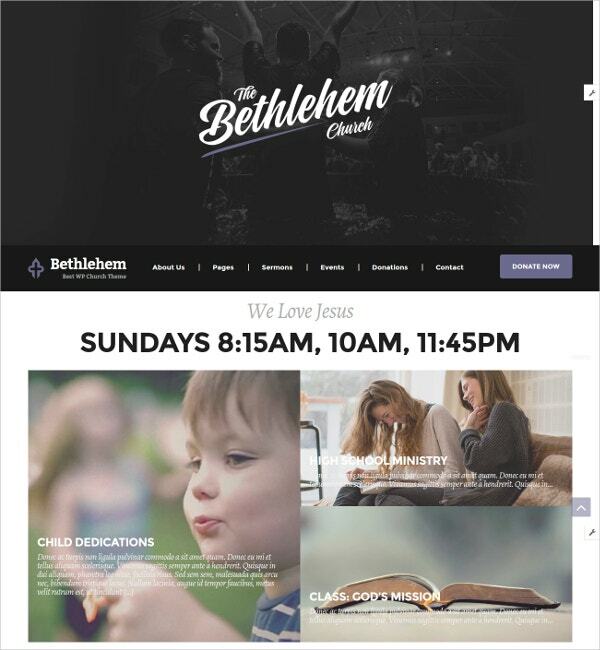 Church sites don’t need to spend on premium themes when simple but functional themes like Malaka have been developed. This template is easy to install and set up for a blog or homepage. 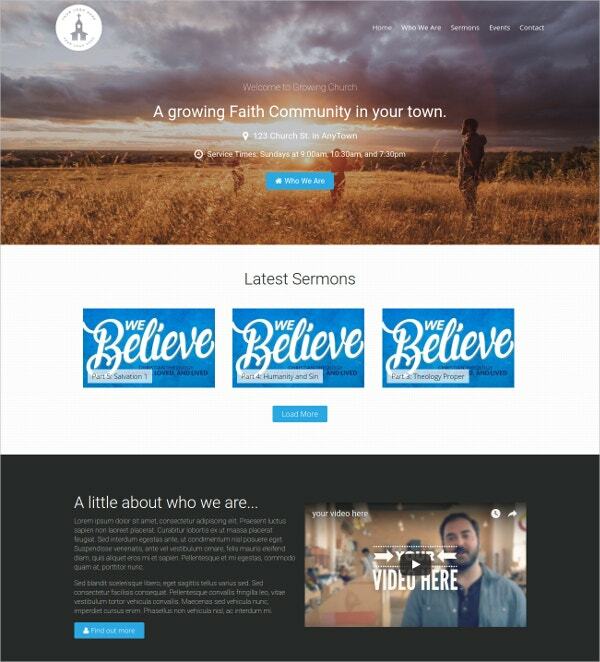 You can create slider items, add new service items through the admin panel, create events sermons, add Bible quotes, style banner ads on the sidebar etc. 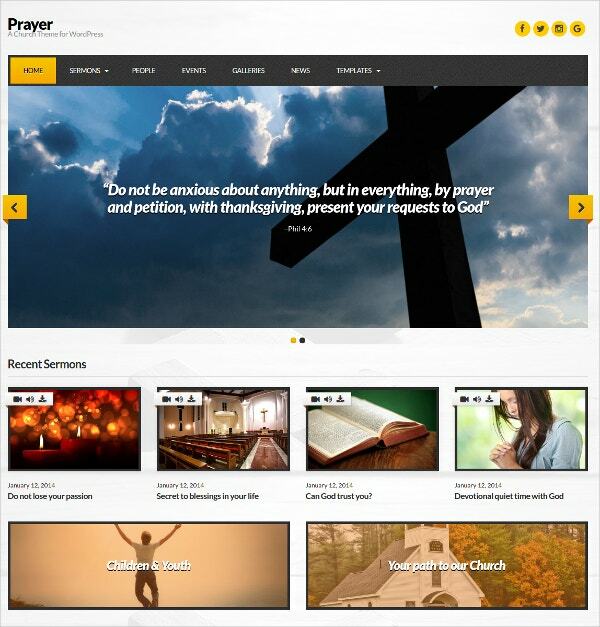 Prayer is an image focused theme that you can inspire visitors with. 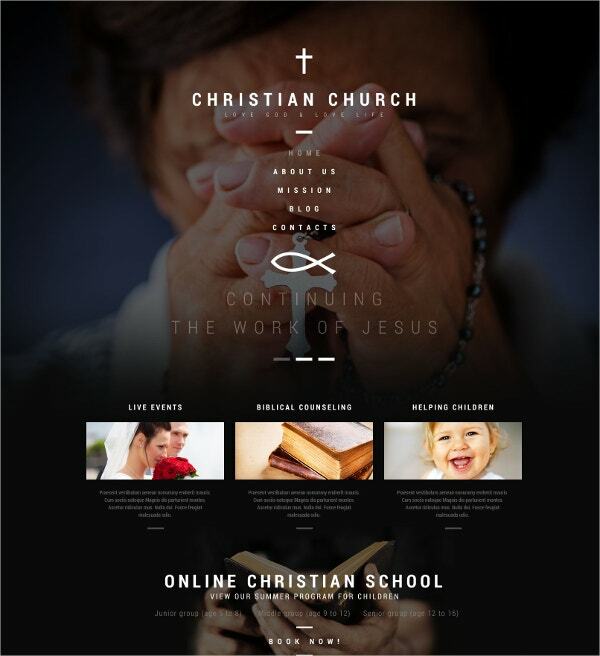 It has a flexible homepage layout that you can add widgets to, toggle sermons and more. The sermon manager lets you upload audio, video and sermon transcripts, and the template supports galleries, sliders, events and personnel posts as well. Modern churches prefer websites that are not just for sharing sermons, but for uploading events and managing them. 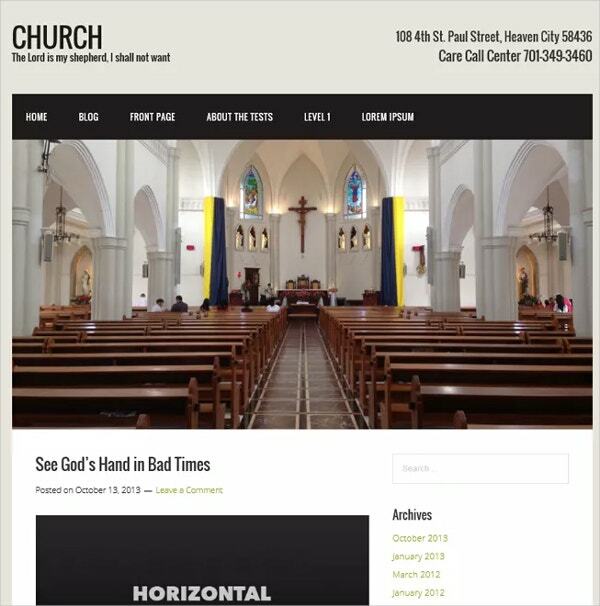 With these Church HTML5 Themes and WordPress themes, you can do all this and more. Many developers have designed custom religious themes that are not just inspiring, but fast-loading and cutting edge as well.